"The best way to spread Christmas cheer is singing loud for all to hear!" Buddy the Elf. Multi-instrumentalist and songwriter, Rebecca Smith, will inspire you and your seedling or sprout to sing and dance to the sounds of the season! Children will play a variety of instruments and will be introduced to guitar, banjo, ukulele and more! 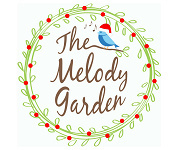 Each class will end with a simple Christmas music themed craft to take home! Sign up for one class or all! Each week will feature a different craft. Please register by December 1. Sign up for one class or all! Each week will feature a different craft.